Tenkar's Tavern: The Swords & Wizardry Appreciation Day Blogfest is Upon Us! Release the Posts! The Swords & Wizardry Appreciation Day Blogfest is Upon Us! Release the Posts! Here's some of the important stuff! There's loot to be had, both from those that blog and those that comment on blogs. Four participating blogs each have a copy of Swords & Wizardry Complete in PDF to give away. You'll have to find them on your own. (try using the blogroll over at 2,000 Coppers to get blog updates). 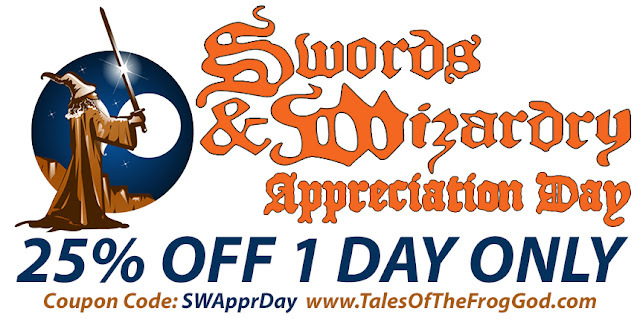 Frog God Games has discounted their entire line of Swords & Wizardry products for 1 day only in celebration of Swords & Wizardry appreciation day (April 17th 2013). The discount is good for 25% off S&W Products but you must use coupon* code SWApprDay on April 17th 2013 at check out. Two adventures posting today. Maybe more as time permits. Post is up, even though it's not showing in the blogroll. I don't have an RPG blog but I will post over on the google+ S&W group! Here is my contribution to the day! Here's mine! It was posted at midnight and I didn't see it pop up on the update posts. There's a typo in the URL for "The Frog God's Blog" I think. Swords & Wizardry Appreciation Day "Loot List"